6th-SAR, $83,000, Msw, 7-23, 2yo, 5 1/2f, 1:04.89, ft.
+ONE LINER (c, 2, Into Mischief–Cayala, by Cherokee Run), a $150,000 KEEJAN yearling, was sent off the 5-2 crowd’s choice in this debut. He tracked the pacesetter through fractions of :22.25 and :46.58, surged to the lead with a furlong to run and pulled clear to score by 1 1/2 lengths over Royal Copy (Bodemeister). Pretty Boy Flash (Gone Astray), who had nowhere to run at the top of the stretch, angled out late to get up for third. 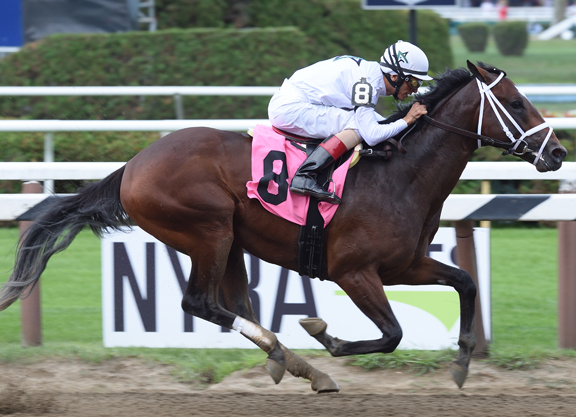 Cayala produced a full-brother to the winner this spring and was bred back to Verrazano (More Than Ready). The winner’s third dam is Chasethewildwind (Forty Niner), dam of Grade I winner Albertus Maximus (Albert the Great), as well as 2014 GI Champagne S. winner Daredevil (More Than Ready). Click for the Equibase.com chart or VIDEO, sponsored by Fasig-Tipton. Lifetime Record: 1-1-0-0, $49,800. O-China Horse Club & WinStar Farm LLC; B-Kingswood Farm (KY); T-Todd A. Pletcher.